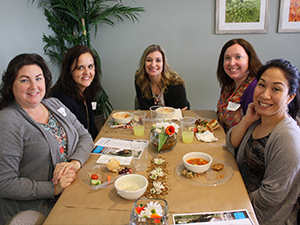 Many new visitors attended Friends of Mercy luncheons last month at the Sacramento, Nashville and St. Louis Mercy homes. Over 100 guests from the respective regions came to learn more about the local and worldwide work and mission of Mercy. Guests at each event enjoyed a complimentary lunch and program highlighting Mercy graduates and their life-transforming stories. In Sacramento, current resident Giselle shared her personal story with the luncheon guests. She told about her 13-year struggle with anorexia and bulimia and how at Mercy she has come to know and believe in God’s love. As her hope is being restored, Giselle is setting her sights on the future. After graduating from Mercy, Giselle plans to attend medical school to become a trauma surgeon. Mercy graduate Berea shared with guests how God restored her through the Mercy program. Emily, a 2013 Mercy graduate, also shared at the Sacramento luncheon. She told guests about the childhood abuse she endured and how she turned to eating disorders, drugs and alcohol, and unhealthy relationships to cope. At Mercy Emily learned to trust God and His plans for her. No longer bound by her addictions, Emily has recently become engaged and is in school studying Psychology. Melanie Wise, Mercy Director of Outreach, shared ways Mercy can equip people to serve their communities. 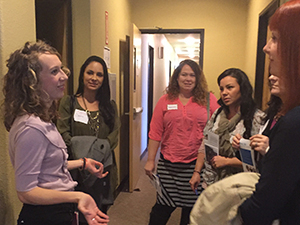 In Nashville, 2015 Mercy graduate Berea shared her personal story of transformation. 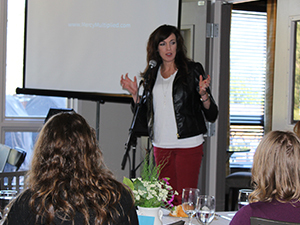 She told guests how Mercy helped her overcome her past sexual abuse and addictions, depression, and self-harm. 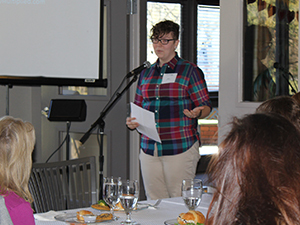 Berea shared with guests how the unconditional love of the Mercy staff helped her love herself. She also spoke about the healing she experienced by renewing her mind with God’s truth and by forgiving those who had hurt her. In St. Louis, current resident Krystal shared about the abuse she suffered at a young age and how at Mercy she has found her hope and identity in Christ. Krystal also shared that God has ignited a passion in her to be an advocate for foster care children in the future. Krystle, a 2014 Mercy graduate, also shared how God helped her overcome abuse, depression, self-harm and an eating disorder through the Mercy program. Equipped with biblically based tools and God’s love through the Mercy staff, she not only found freedom from her issues, but has gone on to multiply that freedom as an intern at the St. Louis Dream Center, where she pours back into the lives of children. The young women who presented at this month’s luncheons are among the thousands Mercy Multiplied has served since its beginning in 1983. Girls ages 13-32 from all socio-economic backgrounds come to Mercy for an average of six months to receive the care and counseling they need to break free from a combination of life-controlling issues. Guests were introduced to Mercy’s many resources. Each luncheon concluded with tours of the respective Mercy homes. 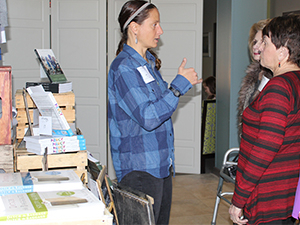 Guests were also introduced to Mercy’s many resources and encouraged to use them as tools to help the hurting within their local churches and spheres of influence. Mercy is thankful for the generous sponsors who made these events possible, including Auburn Grace Community Church and CrossWay Church of St. Charles. If you are interested in attending or sponsoring a future Friends of Mercy Luncheon, be sure to check our Events page for upcoming dates.